When we talk about plants and people, the “Banana family” or Musaceae is one of the prominent ones. Although it has a long history and prominent role in human and wildlife diet, the puzzle of the origin and evolutionary theory of the cultivated banana is still being unravelled (Jeridi et al. 2011) but there are believed to be two key species: M. acuminata and M. balbisiana. The nature of its large inflorescence and leaves makes it difficult to preserve as herbarium specimen. Therefore, taxonomists separate the study of Musaceae into wild and cultivated species. This blog post will focus mainly on wild banana taxonomy. Supervolute ptyxis (the posture of immature leaves) a distinctive features of Zingiberales of which Musaceae is part. According to Blunt (2002) the word “Musa” might derive from the Arabic “mauz” which means fruit; but Linnaeus choose to associate it with Antonius Musa the botanist and physician to Emperor Augustus (63-14BC) instead. Even so, that is not the only conspicuous idea Linnaeus had in mind, he wondered whether the intriguing banana could be the “forbidden fruit” Adam tasted in Eden. This thought captured Dan Koeppel’s attention and he gave further detailed explanations right on the first chapter entitled And God Created the Banana in his 2008 publication- Banana: the fate of the fruit that changed the world. Assuming apple as the forbidden fruit for centuries could mislead us! Musaceae is a Paleotropical family. It forms one of the basal lineages of the Zingiberales clade in the APG3 system and remains unresolved with other “Banana group” families such as Heliconiaceae, Lowiaceae and Strelitziaceae. Nevertheless, its spiral leaf arrangement and monoecious reproductive structure are distinctive morphological characters to distinguish it from others (Simpsons, 2010). Fossil evidence of Musaceae to date is insufficient to give any evolutionary hints yet (Manchester and Kress, 1993). Therefore, although Musaceae is at the basal position of the paraphyly, there is still a lack of solid evidence on its divergence and origin (APG III, 2009). Kress (1990), in his revision of Zingiberales cited A.L. Jussieu Genera Plantarum 1789 for the Musaceae authorship. The genus Musa was named by Linnaeus in his Species Plantarum in 1753. Meanwhile, Ensete another genus in Musaceae was first described by Paul Fedorowitsch Horaninow in his Prodomus Monographiae Scitaminarum in 1862. Terminal inflorescence of Musaceae, monoecious reproductive structure, fruits a berry. Musaceae flowers are zygomorphic and usually unisexual. 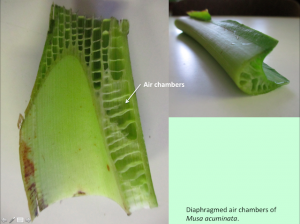 Flora dissection of Musa dasycarpa. At generic level, Musaceae comprises Musa and Ensete. Some literature includes a third genus, Musella. This monotypic genus consists of Musella lasiocarpa (Golden Lotus Banana), a species endemic to Southwest China. There was also once a discovery of Musella splendida in 2002 in Vietnam which shows similar yellow rosette-like inflorescence and dwarf growth form (pseudostem > 60cm). But both of this species have been regarded as part of Ensete due to the shared chromosome number of Musella (2n= 18) with Ensete (Häkkinen and Väre, 2008) and the phylogenetic position of Musella sister to Ensete (Liu et al., 2010). Li et al. 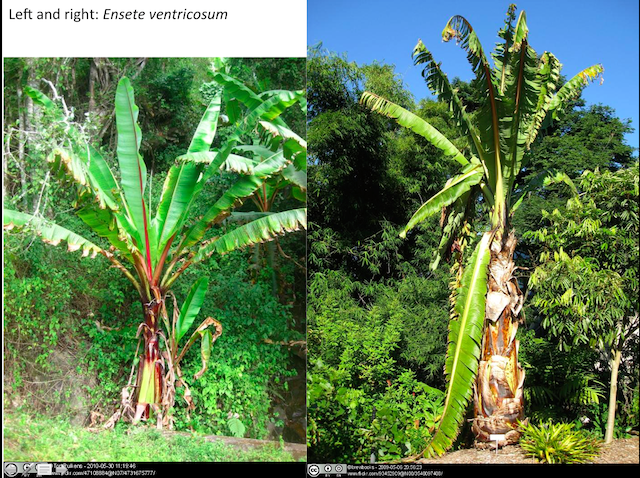 (2010) however hesitated to consider Ensete lasiocarpum as the final status for this Golden Lotus Banana due to its fascinating attributes morphologically as well as geographically. 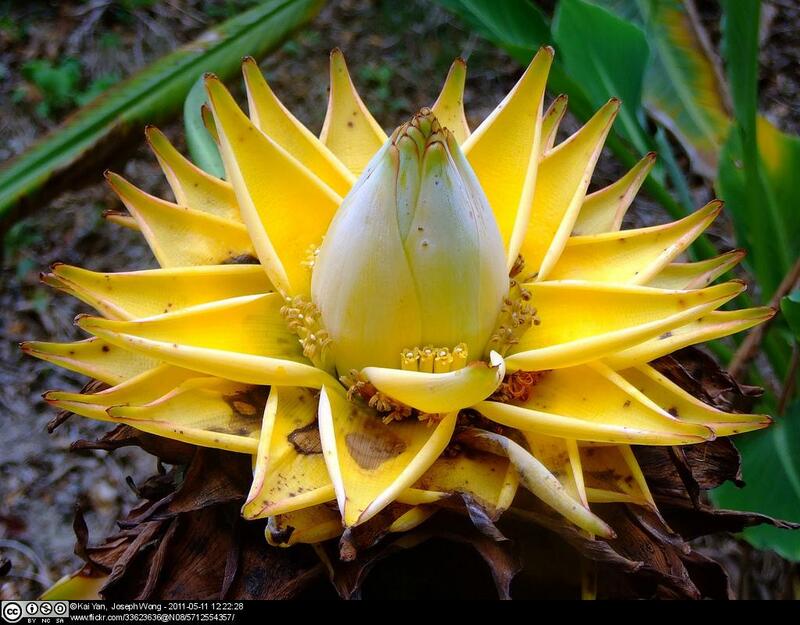 Musella or Ensete lasiocarpa or Golden Lotus Banana has medicinal value to stop skin bleeding and ease inflammation. It also can be boiled and taken internally to cure enteritis, constipation and female disease (Liu et. al., 2003). More details of this plant are available in the Kew database. 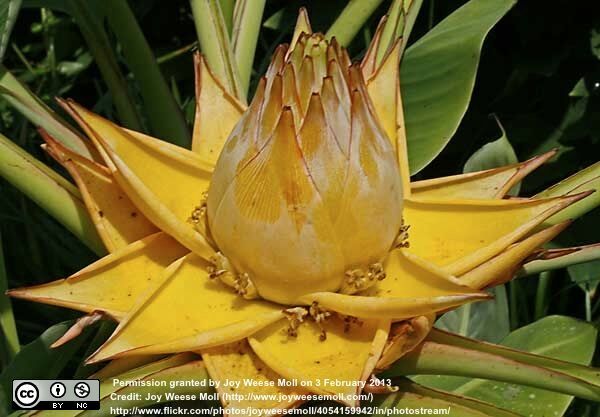 This video link shows the magnificent flowering stage of Golden Lotus Banana. The terminal inflorescence is composed of yellow-orange bracts. Its inflorescence is the same unisexual (female below, male on top) Musaceae trait. The astonishing appearance is popular within the horticultural community. 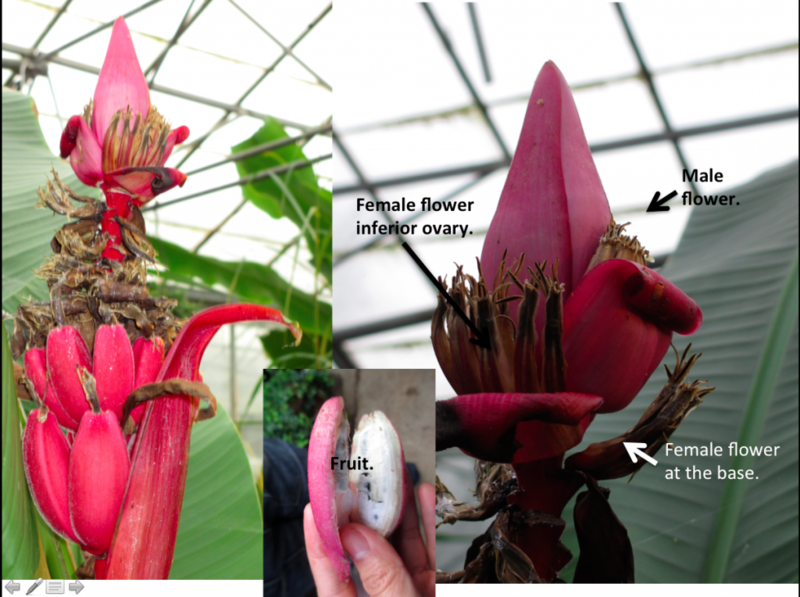 Stages of inflorescence can be seen within this link, where in the end the berry-like fruit common in the Banana family is shown. Picture by Megan (FarOutFlora). Used with permissions. All rights reserved. Picture by Joseph Wong, Kai Yan; Hong Kong. Used with permissions. All rights reserved. Picture by Joy Weese Moll. http://www.joyweesemoll.com/ Used with permissions. All rights reserved. Before we delve into the Musa and Ensete classification respectively, we shall look into the basic differences between them. 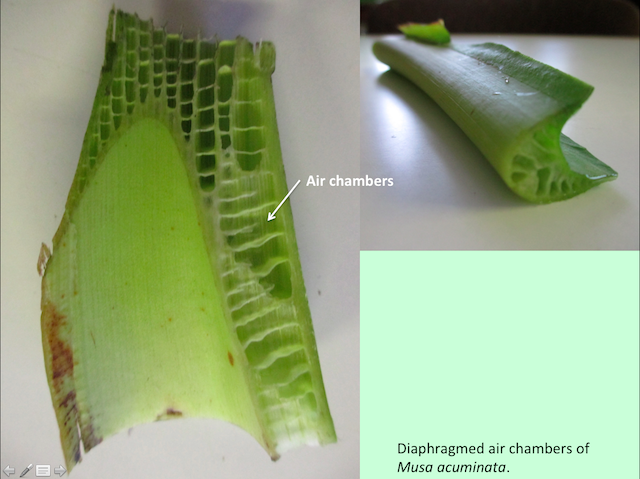 The consensus is Musa has lacticifers sprouting from the rhizome whereas Ensete lacks them; is monocarpic and unbranched (Heywood et al., 2007). Cheesman (1947) whom reinstated Ensete into Musaceae, Ensete is single-pseudostemmed with a dilated base meanwhile Musa is a stooling perennial with cylindrical pseudostems. But Simmonds (1962) in contrast, argued pseudostems in Musa show a slightly swollen base whilst Ensete can sometimes be markedly swollen at the base. He also pointed out that leaf sheaths in Musa are tightly clasping meanwhile Ensete are rather lax and loosely clasping. 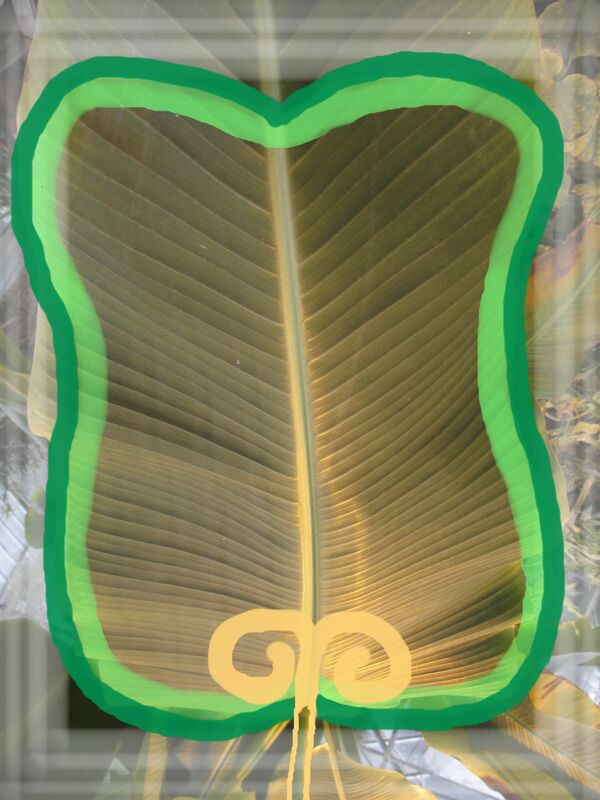 Ensete with bracts and flowers integral with each other and with the axis meanwhile Musa inserted independently on the axis. Pollen grain differ between Musa and Ensete as well, where Musa shows a finely granular surface and Ensete with a regular warty surface and larger than Musa. But none of these give confident delimitation. Hence, even molecular evidence shows Musa and Ensete are distinct clades but morphological differences between them are still vague. To date all of the molecular phylogeny studies for Musaceae only represent a subset of the family, there are several assumptions and issues need to be addressed. Simmonds (1962) suggests anthocyanins that give colours to flower bracts could vary at species level, but again the difficulties in collecting fresh specimen perhaps restrict taxonomist study on it. Liu et al. 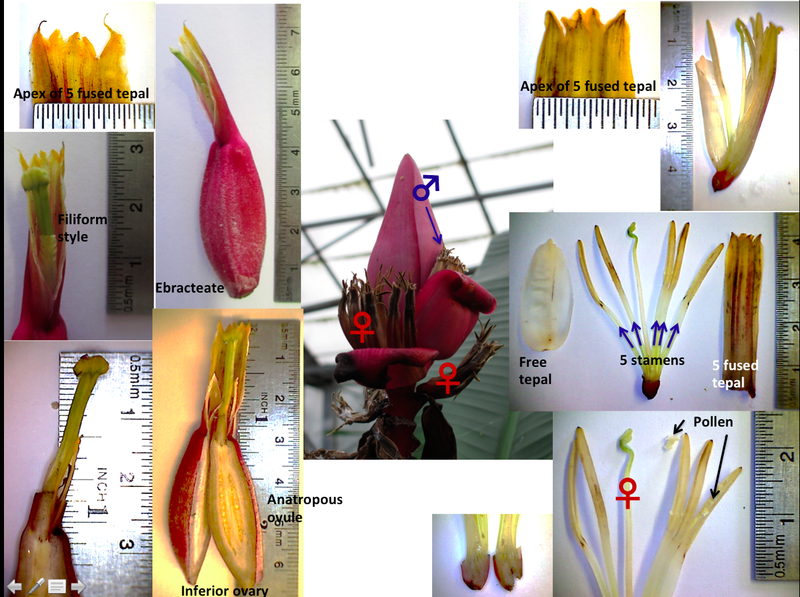 (2010) suggest the difference in inflorescence orientation (erect or pendant) and adaption (bract colours and perianth shape) might be influence by pollinators (Musa– birds; Ensete– bat; Musella-insects) is an interesting viewpoint for Musaceae evolution. However, both of these ideas are subject to the possibility of homoplasy trait in Musa. Another important issue in Musaceae study is taxonomic misidentification (Li et al., 2010). They concluded conflict in the number of species in Musa and position of M. campestris, M. salaccensis, and M. textilis within phylogenic tree needs further study to elucidate. Thus, although Musaceae is a small family, it is a challenge for taxonomist to make judgment on species determination based on a few differences in morphological character and availability of good quality herbaria specimen. The word Ensete is adapted from the Ethiopian Gurage language Ge’ez “እንሰት “inset” means false banana where known as a type of traditional cuisine. Ensete is currently estimated includes five to six species (Simmonds, 1962; Heywood, 2007; Liu et al., 2010) where it used to be 25 species in Cheesman (1947). Afterward, under Simmonds (1962) revision Ensete includes 6 species. Notable species are African members E. ventricosum (Ethiopia to Northern Prov. ), E. homblei (SE. Zaire to N. Zambia) and E. livingstonianum– Synonym E. gilletti (W. Trop. Africa to Malawi) and Asian members E. glaucum (EC. Nepal to Papuasia) and E. superbum (W. India, Assam to N. Thailand). Endemic species are E. perrieri (Madagascar) and E. wilsonii (Yunnan, China). 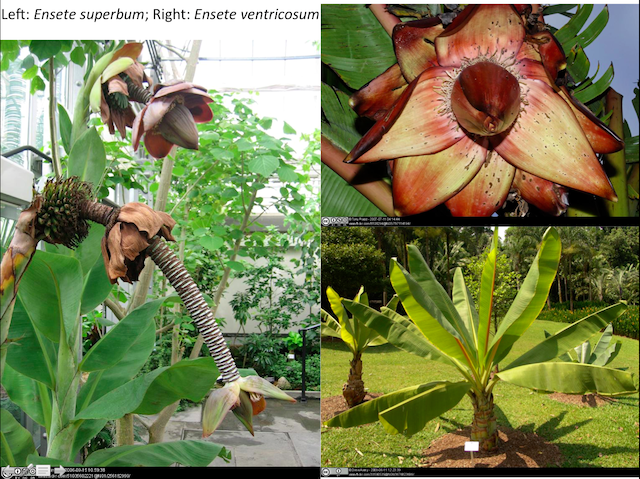 Most of the Ensete species are well known for ornanmental use except E. ventricosum. Ensete ventricosum shows monocarpic habit with swollen base. Ensete inflorescence structure shows bracts and flowers integral with each other (Right top). E. ventricosum in Latin means swollen or inflated on one side is named after its inflated base appearance. Distinctive feature is purplish to purplish-brown leaf midrib and pseudostem. A Kew herbarium specimen shows the bisexual flower and seed with embryo inside. According to Purseglove (1972), E. ventricosum does not produce suckers while being monocarpic. For more details on this plant visit Kew database. It is native and widely cultivated in south and southeasthern Ethiopia as a staple food crop at altitudes of 1500- 3000 m. Video below by Self Help Africa TV demonstrate exactly the food preparation process and twine-making using E. ventricosum. Please note E. ventricosum is also a HERB not tree. 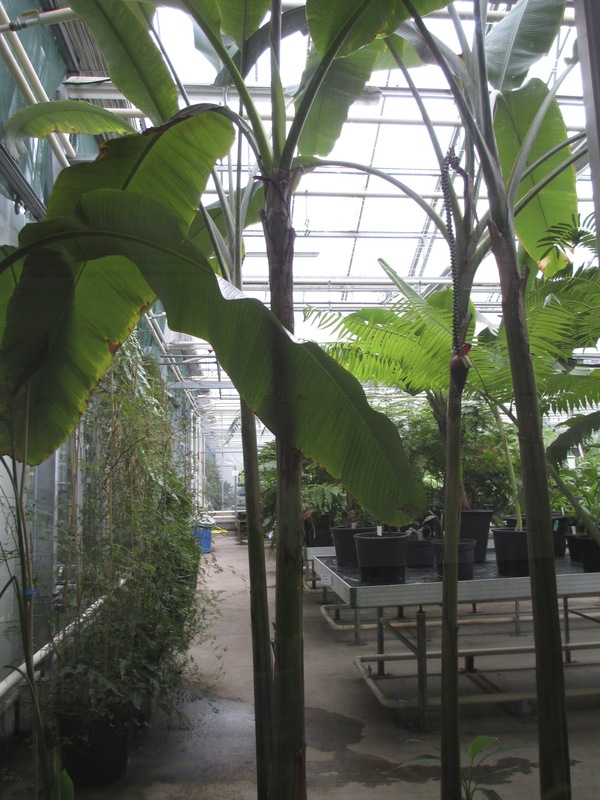 The history of Musa nomenclature began from Linneaus Musa paradisiaca and Musa sapientum and both of these are now recognized as hybrids of cultivar AAB group. The correct nomenclature should be Musa x paradisiaca L. with an “x” denotes it is a hybrid (Purseglove, 1972 and Hobhouse et al., 2004). Musa is around 40 species, occurs from the Himalayas, through southern China, to northern Australia and the Philippines (Heywood, 2007). The difference between wild and cultivated species is that the wild are diploid and cultivars usually triploid, sometimes tetraploid. Cultivation began long before the genus was described by Linneaus, probably 10000 years ago. Currently, there is no clear evidence to show where the first cultivated banana situated, but we know the origin of edible banana is from parthenocarpic and female sterile stock of of wild diploid Musa acuminata (Purseglove, 1972 and Hobhouse et al., 2004). Musa classification according to Cheesman (1947) can be generally divided into four sections: Eumusa (13-15 species); Rhodochlamys (5-7 species); Australimusa (5-7 species); Callimusa (6-10 species). These sections are generalized based on chromosome numbers (x=11 for Eumusa and Rhodochlamys; x=10 for Callimusa and Australimusa), morphological characters and geographical distribution (Cheesman, 1947 and Simmonds 1962). The weakness of this classification excludes certain outliers such as Musa ingens with basic chromosome number x=7. However, this classification using cytogenetic data and distribution has become the backbone for current phylogeny reconstruction. 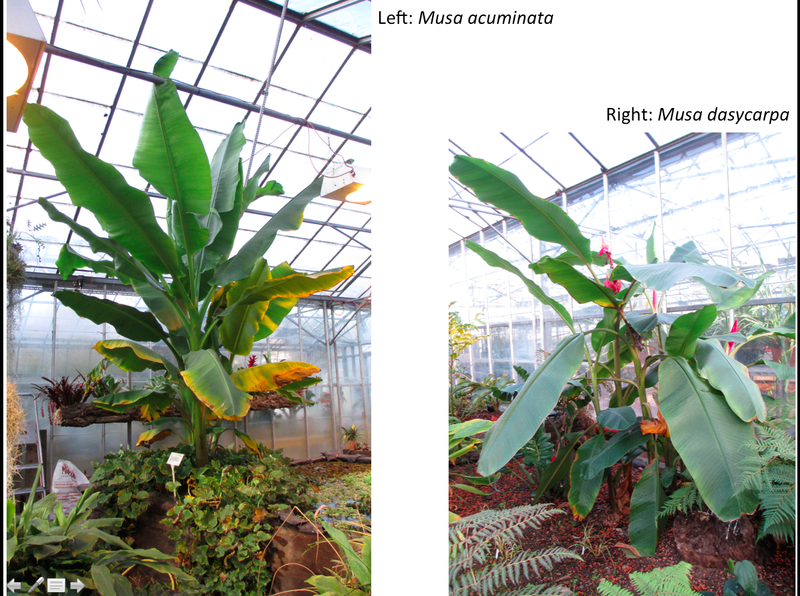 Among the four sections, Eumusa is well known for its diversity that comprises Musa acuminata (A genome) and Musa balbisiana (B genome); the two wild species contribute to the commonest edible banana cultivar for humans. Other notable species are Musa basjoo which is the fiber source for textile in Japan; Musa maclayi, Fe’i banana another edible banana in wild state under Australimusa; Musa textilis, another fiber source for abacá, a type of course textile in Philippines. Musa ornata and Musa dasycarpa within Eumusa and Musa coccinea within Callimusa have ornamental value (Purseglove, 1972). Small wild Musa gracilis here, with purple bracts. 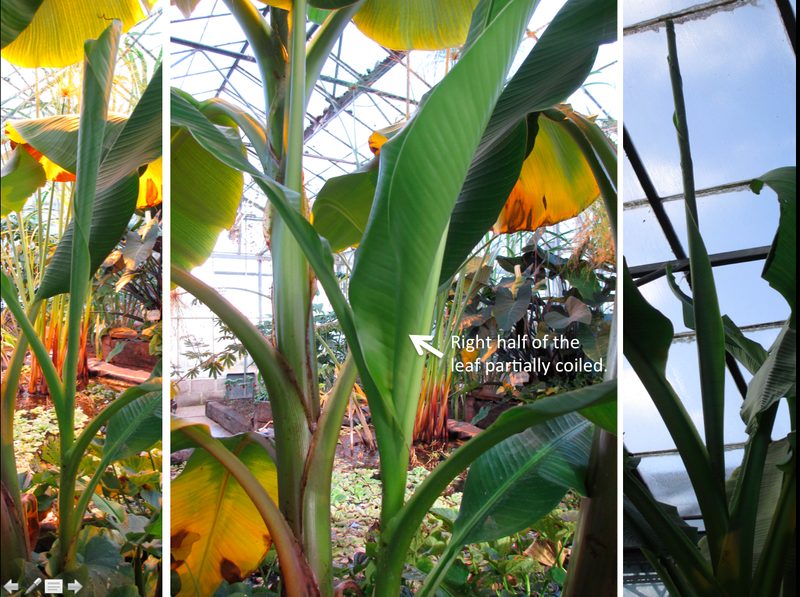 Musa textilis from Kew nursery shows more slender pseudostem and long drooping spike inflorescence. Recent phylogeny studies illustrate Musa classification into two major clades: Eumusa–Rhodochlamys and Callimusa–Australimusa (Liu et al., 2010 and Li et al., 2010). Both of these cladistic studies do not give us morphological circumscription of Musa as a whole yet. However, the Eumusa-Rhodochlamys close relatedness is substantiated by the fact hybridization occurs frequently among members of the clade. Meanwhile in Callimusa- Australimusa, according to Li et al. (2010) a distinct basal sub clade is formed for three Callimusa species Musa coccinea, Musa lutea and Musa exotica, where they share similar seed structure. The previously undetermined Musa ingens has been found nested within this clade as well. 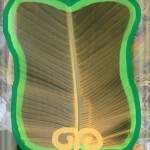 The “iron fan” depicts banana leaf penni-parallel vein. My favorite princess story character is Princess Iron Fan from Journey to the West (1592), one of the Four Great Classical Novels of China literature. The renown author (Wu Cheng’en) muse came from the banana HERB planted in front of his den. The “Iron Fan” named “芭蕉扇- bá jiāo shăn” which also means “banana fan” depicts a banana leaf structure with leaf stalk as the handle and midrib of the leaf as the backbone for the fan structure with penni-parallel venation. This fan has it profound power to subdue the flaming mountains in the story. This is my first impression on banana and whenever I had my traditional delicacy wrapped in banana leaves, it reminds me of her. 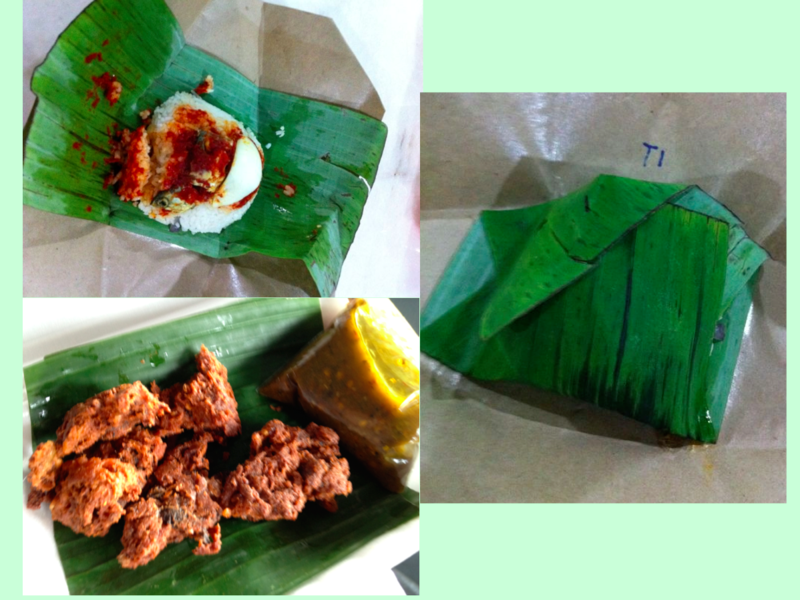 Traditional cuisine wrapped in banana leaf. As mentioned in introduction, Musaceae is special because it shows close association with human civilization but in reality we barely know about other members within the family. Wild banana herb can be easily spotted in countryside and edges of lowland forest in South East Asia. The nature scenery and living culture of rural areas within the region would not be complete without it. Lumaku Virgin Forest Reserves Sipitang, Sabah. Picture by Liew. Banana herbs along roadsides- Sipitang, Sabah. Picture by Liew. Sipitang, Sabah. Picture by Liew. Grown in open space-Tawau, Sabah. Picture by Liew. Tawau, Sabah. Picture by Liew. Banana integrated farming with rice field- Bali, Indonesia. Picture by Liew. Along the roadsides of Bali rural area. Picture by Liew. Perfect rural scenery. Picture by Liew. Its occurrence in wild state is to give shades to new seedlings of plant in forest floor and provide fruits for wildlife. But when it becomes economic important crop for human, it requires high demand of sunlight by open space, water and nutrient (Purseglove, 1972). The irony is similar with most of the plant crop, human very much need wild species of it (mainly to increase genetic strength towards plant disease) but knowledge of its diversity remain obscure. From BBC documentary on Saving Baby Orangutan, Dr. Lone Dröscher gave a bunch of banana for the family gave-away their capture, for me that is the best reflection for humanity versus nature. For the future, environmental challenge induced by Banana trade is another issue human would face. For the present, as a consumer we could reduce the environmental pressure by supporting fair trade and organic farming. 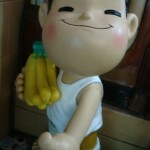 Furthermore, we must be aware of issues in banana plantation, for instance from NGO such as BananaLink. This notion is important as human race would not have “Iron fan” to come into rescue for our already warming Earth. Blunt, W. (2004). Linnaeus: The Compleat Naturalist. Frances Lincoln Limited. Bisby FA, Roskov YR, Orrell TM, Nicolson D, Paglinawan LE, Bailly N, Kirk PM, Bourgoin T, Baillargeon G., eds (2010). Species 2000 & ITIS Catalogue of Life: 2010 Annual Checklist. Digital resource at http://www.catalogueoflife.org/annual-checklist/2010. Species 2000: Reading, UK. Heywood, V.H., Brummitt, R.K., Culham, A. & Seberg, O. eds. (2007). Flowering plant families of the world. Kew: Royal Botanic Gardens, Kew. Hobhouse, H., Knapp, S., and Lowndes, M. (2004) Seeds of Trade. http://www.nhm.ac.uk/nature-online/life/plants-fungi/seeds-of-trade/ (Accessed 15th January 2013). Jeridi, M., Bakry, F., Escoute, J., Fondi, E., Carreel, F., Ferchichi, A., … & Rodier-Goud, M. (2011). Homoeologous chromosome pairing between the A and B genomes of Musa spp. revealed by genomic in situ hybridization. Annals of Botany, 108(5), 975-981. Koeppel, Dan. (2008). Banana: the fate of the fruit that changed the world. Penguin Group. Kress, W. J. (1990). The phylogeny and classification of the Zingiberales. Annals of the Missouri Botanical Garden. 77. 4: 698-721. Kress, W. J., Prince, L. M., Hahn, W. J. & Zimmer, E. A. (2001) Unravelling the evolutionary radiation of the families of the Zingiberales using morphological and molecular evidence. Journal of Systematic Biology 50. 6: 926-944. Li, L., Häkkinen, M., Yuan, Y-M., Hao, G. & Ge, X-J. (2010). Molecular phylogeny and systematics of the banana family (Musaceae) inferred from multiple nuclear and chloroplast DNA fragments, with a special reference to the genus Musa. Journal of Molecular Phylogenetics and Evolution. 57: 1-10. Liu, A-Z., Kress, W.J., Wang, H. & Li, D.-Z. (2010). Phylogenetic analyses of the banana family (Musaceae) based on nuclear ribosomal (ITS) and chloroplast (trnL-F) evidence. Taxon 59: 20-28. Manchester, S. R., & Kress, W. J. (1993). Ensete oregonense sp. from the Eocene of Western North America and its phytogeographic significance. American Journal of Botany. 80: 11. 1264- 1272. Purseglove, J.W. (1972). Musaceae. In: Tropical Crops Monocotyledons 2. Longman Group Limited, London. 343-384. Simpson, M. G. (2010). Plant Systematics. 2nd edition. Elsevier INC.
Simmonds, N. W. (1962). The Evolution of the Bananas. Longmans. This entry was posted in Africa, Asia, Crops, Palaeotropics, Students and tagged apple banana, banana, banana flower, banana fruit, bananas, Musaceae, pink banana, yellow banana. Bookmark the permalink. 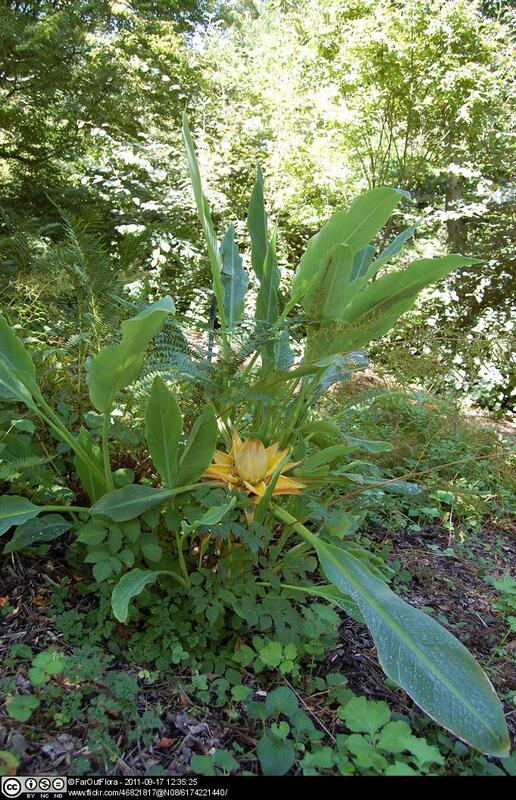 5 Responses to Musaceae – GIANT HERBS not trees!